111 p., 15,5 x 23,0 cm. With contributions by Georg W. Bertram, Katharina Held, Vittorio Hösle, Michael Kober, Adolf Rami and Christian Schemmel. The paper aims to give a sketch of an anthropology that is both anti-reductionist and non-essentialist. We can meet these two conditions if we explain what it is to be human with the concept of second nature. Accordingly, human beings are to be understood as beings that acquire a second nature. The second nature under consideration has two aspects: It consists in the initiation into and understanding of cultural traditions as well as in the exercise of symbolic reflexive abilities; it is thus connected irreducibly to a dimension of self-formation. Consequently, the central anthropological question that we ought to raise is ,Who do we want to be?›, not ,What is a human being?‹. Against the background of these fundamental commitments, this paper lays out in a programmatic fashion the perspectives of an anthropology of second nature. Vittorio Hösle: Was kann man von Hegels objektiv-idealistischer Theorie des Begriffs noch lernen, das über Sellars', McDowells und Brandoms Anknüpfungen hinausgeht? 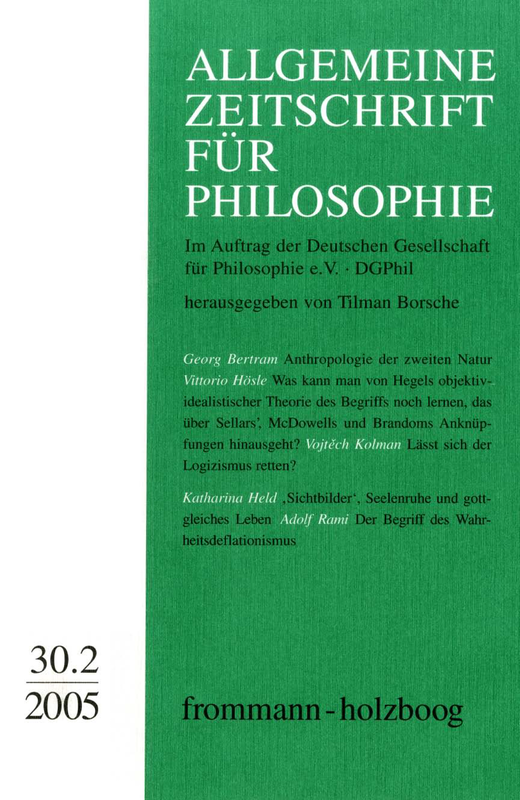 The essay analyzes in the context of a cyclical theory of the history of philosophy the conditions under which the turn to Hegel has occurred within recent analytical philosophy; Rorty is ascribed a decisive role comparable to that of Hume. The main difference between McDowell’s and Brandom’s reception of Hegel consists in the fact that the former interprets Hegel starting from the relation between nature and spirit, the latter starting from the problem of intersubjectivity. In a second part it is shown what central moments of the Hegelian theory Sellars, McDowell and Brandom neglect, despite their insistence on the irreducibility of the normative and their inferentialism. They neither recognize the peculiar position of a set of concepts that can grasp the essence of a structure, nor have they developed a theory of concept formation; the concepts remain with them something given. Vojtěch Kolman: Lässt sich der Logizismus retten? The objective of my article is to show why it is impossible to maintain the doctrine of logicism. I am deeply aware that rather than solving the problem, general claims concerning epistemic nature of mathematics usually create new ones, therefore I try to proceed as specifically as possible with concrete references to Crispin Wright’s neologicism, George Boolos’ Fregean studies and Paul Lorenzen’s operativist account of mathematics. My main thesis rests on the observation that logicism undervalues the practical, calculational character of arithmetic: I demonstrate in detail why inductive definition, i.e. the Kantian operative element, is not meaningfully eliminable from the foundations of arithmetic, at least not by means of the Fregean logicism or its alleged (Wright’s and Hale’s) successor. Michael Kober / Christian Schemmel: John R. Searle, Rationality in Action.